With every successive step the trail got steeper and our brief rests more frequent. We didn’t just stop to fill our lungs with gulps of thin air, but also because the view was so immense we couldn’t take it in at a glance. Every momentary pause gave us time to look deeper into the valley and at the trail ahead. It was a stunning sight to behold. Directly in front of us was the Huaytapallana glacier, a jumble of ice draped over an impossibly steep rock face. Flanking either side of the glacier towered the twin peaks of Huandoy and Huandoy Sur, both piercing the sky at over 20,000 feet tall. In the distance we could hear a waterfall periodically interrupted by the rush of a gentle wind. Adding to the serenity of the scene, and as if on cue, an eagle soared overhead linking swooping turns as it caught one thermal after another until it was out of sight, lost in the blue. As we picked our way through boulders and the final section of trail, we arrived at a small turquoise lake perched on a ledge at 14,000 feet. We dropped our packs, snacked on sandwiches, and spent the next hour lounging on rocks and gazing at massive ice-capped peaks. If there is a better way to spend a morning, I haven’t found it. For the adventure traveler, Peru is a bucket list destination but most people associate the country with iconic images of trekkers standing on the escarpments of Machu Pichu. 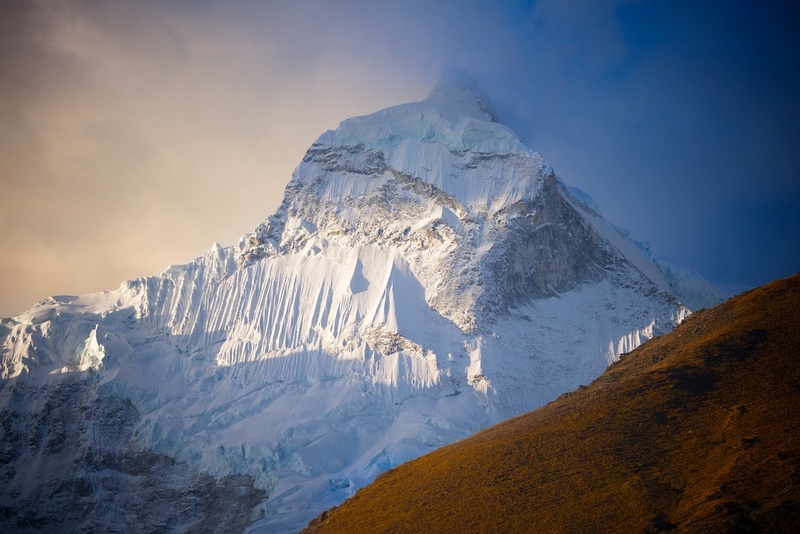 Not to say that isn't a worthy visit, but just to the North is another equally impressive attraction, the ivory peaks of the Cordillera Blanca. The second highest mountain range in the world, the Cordillera Blanca have more than 33 summits over 18,000 feet with the tallest, Huascarán, breaking 22,000 feet. Despite its proximity to the equator, the range has 663 glaciers including one ice cap. As mountains go, they rival the enormity of the Himalayas and the beauty of the Alps. The region’s most famous peak, Alpamayo, is touted by many as the most beautiful mountain in the world. It is also one of the more elusive and only accessible by way of a multi-day approach on foot. The bulk of the Cordillera Blanca is contained within the boundaries of Huascarán National Park. Designated as a UNESCO World Heritage site in 1985, it encompasses 1,300 square miles and is webbed with dozens of serpentine gravel roads and trekking trails. Bring your best set of lungs if you plan to walk those tracks as many of them reach staggering heights. Hike to the distant ends of those routes and your efforts will be rewarded with dramatic vistas beyond description. Like most travelers to the region, we arrived in the quaint town of Huaraz weary from a long bus journey and slightly short of breath. 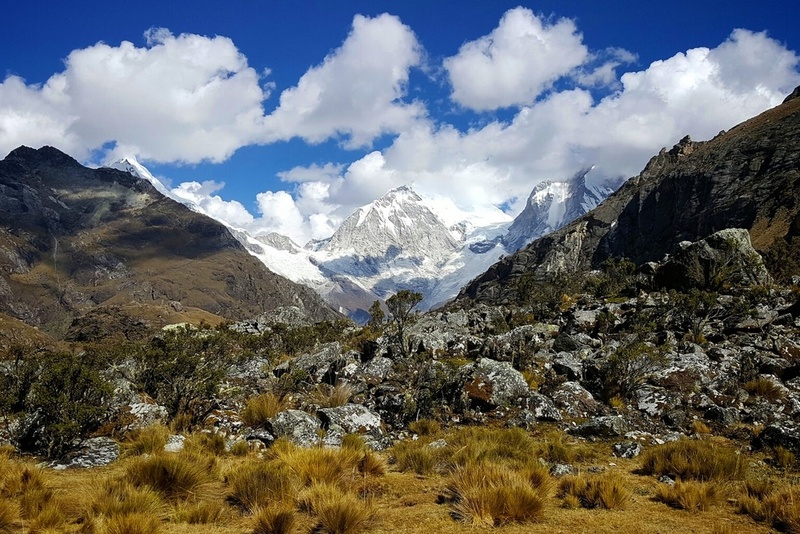 At an altitude of 10,000 feet, Huaraz is a common jumping off point for forays into the park and a good opportunity to acclimatize to the thin air. I have a fondness for South American towns and thoroughly enjoyed walking the colorful streets, some quiet and tranquil, others vibrant and bustling with activity. Just beyond the edge of town, the 20,700 foot summit of Huantsan glistened in the morning sun reminding us why we had traveled so far. Despite the natural beauty of the area and the charm of its modern towns and villages, other cultural treasures offer a glimpse into Peru’s age of antiquity. Allowing ourselves more time to adjust to the altitude, we spent a day exploring the interior of the mountains and drove to the hamlet of Chavin. Like many of the country’s archeological sites, the ancients who lived in this part of the mountains created elaborate structures festooned with intricate works of art. Originally founded in 900 BC, the ceremonial complex at Chavin predates Machu Pichu by more than 2,000 years. A central feature of Chavin’s temple is a carved monolith called the Lanzon. Burried deep within a labyrinth of tunnels and dark chambers the 15 foot tall deity depicts a key figure in the Chavin religion. With it’s curved fangs, down turned eyes, and ominous placement in the depths of the temple, it evokes haunting images of what ritualistic life was like for these ancient people. Throughout the site there are images of the condor, puma and serpent, the three sacred animals that represent the sky, earth, and underworld. Although the original inhabitants no longer dwell in the valley, their ghostly presence is palpable. As a first time visitor to Peru, I arrived with many preconceived expectations, most formed by casually reading travel blogs and guidebooks. On the trip back to Lima and subsequently home to the States, I realized that the Peru I thought I would experience was very different from the Peru I discovered. It is far more majestic, colorful, and intoxicating than I could have ever imagined. What I loved most is how the mountains, the people who live within them, and the legacy of their ancestors, all exist in perfect harmony. It has only been a few weeks since my return from Peru. My bag is still not fully unpacked and my boots still wear the dust of the Andes on their soles. I know I've found a special destination when I'm slow to let go of the experience and most of all––eager to return.